Paolo Sorrentino and Toni Servillo team up again for Loro and this time take on Silvio Berlusconi. Helen Barlow caught up with the two Italian powerhouse talents during the Toronto Film Festival. A kind of mix of their previous movies Il Divo (about Giulio Andreotti) and their study of decadence, The Great Beauty, Loro is a biting satire about Italian politics. Helen Barlow caught up with the two Italian powerhouse talents as they sat together on a couch during the Toronto Film Festival in early September. Your working relationship extends again. Did you find something new about each other this time? Paolo Sorrentino (PS): Every film is a new adventure, so something has to happen that makes sense and that surprises you at the same time. Working with Toni is a habit for me and it’s reassuring because we work in an environment where there are a lot of fake people, a lot of posers who take themselves way too seriously. Toni is a serious man but he knows how to have fun. Toni Servillo (TS): For me working with Paolo wasn’t anything new. Reading the script and memorising 12 to 15-page scenes, almost a monologue, was daunting. The difficulty was in having to create the character in two or three scenes. Then it was hard to maintain the balance between the histrionic mask, the seducter that Berlusconi is, and when he wants to wear a different mask that embodies the mercilessness of power. What were your own feelings about Berlusconi that influenced your screenplay? PS: I was not interested in the well-known aspects about Berlusconi but in facts about him that were not very well known. I was fascinated by the biographies written by people who knew him as a businessman before he went into politics and how he sold some ad spaces and basically shifted his approach into the political arena by selling dreams and illusions. Another approach was to explain the emotions of this man, who I presume has a habit of presenting a sugar-coated portrait of himself. It’s very narcissistic, very positive, everything he has achieved is great and wonderful—but it cannot be true. So I wanted to look behind that screen of success and joy and understand the pain and the difficulties that he harboured inside himself. Did you face any legal issues in presenting someone who is powerful and rich and who might not like certain things being said about him? PS: No, no legal issues, because the fiction goes hand in hand with the careful attention to detail, to avoid any kind of lawsuit. These are scripts that are written with a lawyer beside you in the sense that you write the script and he points out certain things where you might have legal issues. Have you ever met Berlusconi? PS: I’ve met him twice at lunch. Did you meet him for the film? PS: The first time no. The second time yes. He found out I was making a film about him and he invited me to talk about it. Did it have an effect on the film? PS: No. This happened to me when I met Andreotti (the former Italian Prime Minister) before I made Il Divo. The idea of showing a real person is useful to me only in the way in which I study the details, but not the conversation itself. When a person knows they will be on screen they always present a glossy image and I know it’s all a pose so I’m not interested in what they say. I’m interested in the small details. For example I noticed Berlusconi’s excessive presence of telephones wherever he was. At lunch whenever the table was being set, between a fork and knife there was always a phone. These little pieces of information are important, so are the moments when Berlusconi feels tired. TS: I never met him. To TS: How much did you try to mimic Berlusconi and how much was your own invention? You smile a lot. PS: He [Berlusconi] smiles a lot. TS: Of course working on a real character who has played a primary role in the Italian political arena for 20 years and who has captured the imagination of many people, it was necessary for me to give him two, three or four attributes that are instantly recognisable. It was necessary for me to communicate with the audience, but for example when you have a scene where Berlusconi is talking to his business partner and both characters are played by the same actor, then you have a situation in which you can express yourself with more personalised nuances. Also, when he is selling the apartment to this lady on the phone I took some liberties as an actor that were detached from a sense of photorealism and are closer to the imaginative portrait Paolo had of this character. I want to point out this is not a biopic. It's a symbolic film of what happened for many years in Italy where instead of a political arena made up of ideas and dreams around which you build a community, we had an agenda dictated by illusions. So you didn't have political ideas. They were replaced by the concept of spectacle, of show, of display. TS: Playing Berlusconi without a smile is like playing Churchill without a scotch in his hand or Ghandi with a pair of boots and not walking around barefoot. Did Berlusconi see the movie? How difficult was it to create the party scenes? PS: They were difficult because there were a lot of extras and extras tend to get tired quickly. So we had to create a party atmosphere before we shot the party for the film. 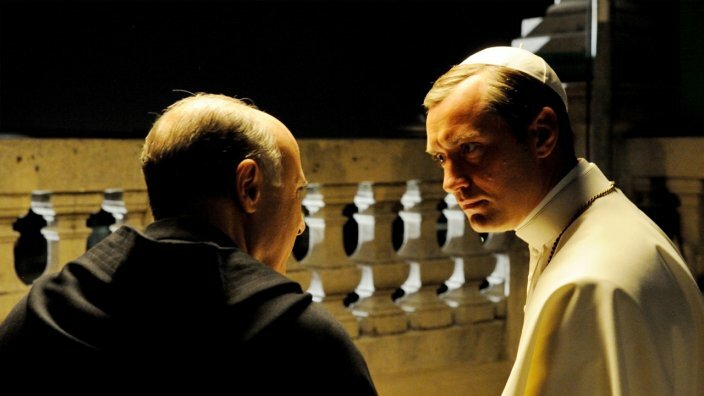 When are you shooting The New Pope, the sequel series to The Young Pope? PS: I’m starting next Monday. PS: Diane Keaton’s not there, but John Malkovich is in it. HBO will kill me if I say too much. I want to point out this (Loro) is not a biopic. It's a symbolic film of what happened for many years in Italy where instead of a political arena made up of ideas and dreams around which you build a community, we had an agenda dictated by illusions. So you didn't have political ideas. They were replaced by the concept of spectacle, of show, of display. Why isn’t Toni in it? PS: Toni doesn’t want to act in English. That is the reason. TS: I’m a European actor. I act in Italian and French. You have based some of your movies on real life people and with The Young Pope you drew on various real life members of the clergy. This is your version of Berlusconi but it was still a risky proposition. Are you someone who takes risks easily? PS: No, in my life I’m a scared person. I’m very careful and very prudent. But I have a little bit of courage in my films. Of course these are calculated risks because my films are largely wonderful playful games. It’s more stimulating to expose yourself to the risk of great failure or possibly great success rather than making films that go unnoticed. You are Italy’s leading filmmaker after you won the foreign film Oscar, the best film at the European Film Awards and a Golden Globe for 'The Great Beauty.' Does that success give you confidence to tackle films about powerful people? PS: No I don't think so because when I made Il Divo I hadn’t won an Oscar and we risked a lot more then. That film is much sterner and tougher on the real character of Andreotti than this film is towards Berlusconi. Another collaboration with director Paolo Sorrentino, another great performance by Italian actor Toni Servillo. So why didn’t you go tougher on Berlusconi? PS: That’s not the motivation for me, the desire to attack a person. For me films are more interesting if they are outposts from which you approach the character in order to understand them, not to criticise them. If you want to criticise or attack someone I think newspapers would be a more suitable forum. TS: I’ll ask you a question. What do you think of the scene where the girl is lying on the bed looking at Berlusconi saying he is pathetic because his breath smells like her grandfather’s? Don’t you think that is more of a political statement than some kind of ideological standpoint? That’s the approach young people have towards the older generation, this pitiful spectacle that they present for them. I think a film should have a symbolic force. Otherwise you might as well produce a political pamphlet. I think the shot of the terrace with all those lazy, do-nothing intellectuals in The Great Beauty is more of a political statement than a lot of films that present themselves as politically charged. To TS: Did your opinion of Berlusconi change through researching and playing him? TS: No I haven’t changed my mind at all about Berlusconi. I think Berlusconi brought an illusion to the political arena. He’s a character who has relied on his histrionic skills in order to achieve success and the consequence is that people think of him exactly as he thinks of himself. Do you both see parallels between Berlusconi and Donald Trump? TS: We’re not the only ones who have drawn this parallel. I think in a way Italy was ahead of its time. We have two tycoons who get into the political arena giving the impression that they know how to solve problems, yet at the same time they present themselves as outsiders to politics, politics in the most noble sense of the word. In his new movie Fahrenheit 11/9 Michael Moore says Trump is not to be under-estimated and that he is clever. Do you think Berlusconi is clever? TS: I think the mistake of the Left in Italy was to see him either as a monster or a freak show, whereas Berlusconi should have been thought of as a sadly normal person. So they made Berlusconi into the central problem of the country in the same way that Trump is now a world problem. They viewed this man with shock and awe instead of presenting a valid opposition, which could have been done by offering a clear alternative to Berlusconi. And this allowed Berlusconi to dominate the political arena. Loro is out now in Australia cinemas.